For National Potato Month, I thought it would be fun to post an informative post about potatoes. I thought about publishing something on the history of the potato. But then my husband shared a tip with me he read the other day about using Vicks VapoRub to treat mosquito bites, and that got me thinking about folk remedies…which naturally led me to thinking about folk remedy uses for the potato. So, I started doing some research, and here’s what I found out. Drinking potato juice can also help you flush out toxins from your body. If the idea of drinking straight potato juice sounds too gross to bear, you can add a little bit of apple or carrot juice to make it more palatable. I’ve never tried this, but now that I know about it, I’m going to do it the next time I get a headache (I get them all the time!). Cut a raw potato in half and put each half on a temple. Gently rub the potato halves against your temples until the pain goes away. Use the insides of potato peels to remove your eye makeup. Reduce dark circles under your eyes by placing cut potato over them for about 5 to 10 minutes every morning. Wash your face daily with potato juice to prevent wrinkles. Cut a potato in half and put the cut side against your skin to reduce the appearance of acne. Rub a piece of cut potato on your sunburned skin for immediate relief. Potatoes are supposed to work even better than aloe vera for sunburn! Got a wart? Potatoes will take care of those too. Just cut the potato and rub it against the wart every day until the pesky thing is gone. 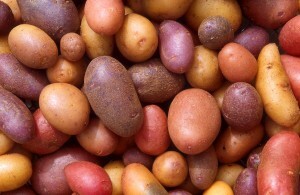 Potatoes help you sleep somewhat indirectly. They prevent stomach acids from disturbing your sleep at night. Just eat a boiled or mashed potato with milk before bed to have a peaceful, uninterrupted night’s sleep. Is there anything harder to get out than beet or berry stains? I haven’t seen anything yet – well, exceopt for maybe red Kool-Aid. But a peeled raw potato provides a quick, easy, and inexpensive way to get rid of these stubborn stains. All you do is take the potato and rub it against the stain until it disappears. You know when you’re working on a craft project, and you get glue all over your hands (or is that just me)? You can use raw potato to remove glue or any other sticky substance from your hands – even chewing gum! Who knew potatoes were so magical? I didn’t. I just know I love to eat them. And now I think I might eat them more often! This is the coolest post ever!! Thanks so much for sharing 🙂 Potatoes are the best!